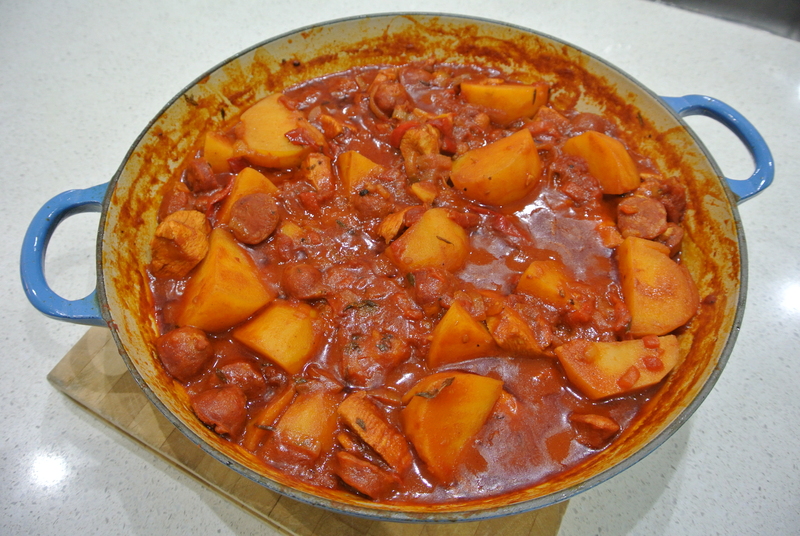 Patatas A La Riojana…or more simply potatoes with peppers and chorizo, has become a firm favourite in our household. Its a great winter warmer, or when the nights start drawing in and there is a chill in the air. Rich, spicy, and meaty….and of course, very simple to make. Heat the oil in a large pan over a medium heat, adding the garlic, onion and red pepper. Fry slowly until golden, which will take about 15 minutes…don’t let the mixture burn. Add the chopped tomatoes, chorizo, pimenton, potato chunks, and cook for a further 5 minutes. Add the vinegar, thyme leaves and cover with water (approx 1 to 1.5 litres of cold water). Season with plenty of salt and freshly ground black pepper, bring to the boil, and then cover and simmer gently for about 25 minutes until the potatoes are cooked. Don’t stir it too much, but do check it frequently to ensure it does not stick. When cooked, serve immediately with a good crusty bread. If you want to make the dish even more hearty, add a couple of diced chicken breasts or skinned chicken thighs at the same stage as the chorizo.